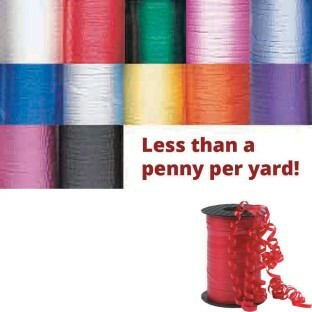 500 yards of beautiful 3/16" ribbon. Please specify white, red, emerald green, hot pink, baby blue, royal blue, silver, yellow, orange, purple, black or burgundy when ordering. Must have for balloons. The large spools really last. I dispense recognition gifts at work and like to dress them up a bit. The ribbon is just the trick! It curls great but even better is that it doesn't tangle like small rolls of ribbon tend to do. The sturdy reel keeps it neatly stacked on the corner of my desk. In addition I am involved with charity events and use this for balloons and other decorating needs. Very economical.I normally don't give 5-stars because we can always get better but with this I had to. Great curling ribbon at a wonderful price! Great deal!